Heavy Haulers | Your Freight Shipping Specialists! 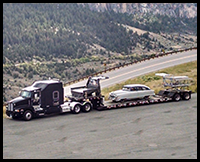 Choose Heavy Haulers to ship your freight across the U.S., Canada and Mexico. 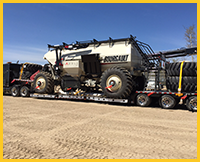 Your largest pieces of construction equipment travel as full truckloads aboard specialized trailers. Smaller pieces of construction machinery might be able to ship Less Than Truckload (LTL), which will save you some cash. Speak with one our qualified representatives to arrange the best deal on your construction equipment transportation. Container shipping aboard flatbed trucks also is available. We’ll even handle the transfer of your container to other modes of shipping. Need your construction equipment or your container exported internationally? Our logistics specialists arrange intermodal container transfers every day. Speak with one of our dedicated representatives about shipping your construction freight today! Ship your cargo as a full truckload aboard the trailer that matches your needs. Describe your construction equipment to one of our knowledgeable representatives. As part of your free quote, you’ll receive professional advice on the best way to ship your equipment. We’re trailer experts! Speak with us about selecting the perfect trailer for your needs today. Any type of trailer your shipment requires, we have it. Save money by shipping your construction equipment as a partial load. Combine your smaller load with another customer’s cargo to reduce your shipping charges. Let us handle the logistics, matching your cargo and destination with another similar-sized piece of cargo heading in the same direction. Just another way we take care of our customers. Call us today! Ship your construction equipment in a sealed container. 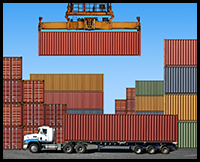 Intermodal containers, which come in standardized dimensions, are the preferred type of shipping container. Since intermodal containers are standard sizes, your cargo can be transferred among shipping modes. Even if you don’t ship using multiple modes, container transport is an efficient and dependable way to transport your construction equipment. Talk with us about shipping your container using multiple modes of transportation. Called intermodal shipping, the method is a popular way to ship cargo long distances or internationally. You’ll love the extra security. Intermodal containers are transferred without opening, so nobody knows what’s being shipped. Rely upon our trained logistics professionals to merge the methods of transportation together into one seamless package.